any years ago our Catalog said “To hear little birds singing and smell the freshness of a spring morning… that’s almost heaven!” It’s spring in Texas (and in a lot of the country!) and the little birds are indeed singing! In fact, the Folks at Vintage are already enjoying more time on our porches... watching and listening to the birds, listening to nearby frogs croaking at dusk, and admiring our blooming yards as the days get longer and warmer. We at Vintage also appreciate our porches for the rest they provide from chores inside the home. They are great places to socialize with family and friends or to just relax with a tall glass of iced tea or lemonade. 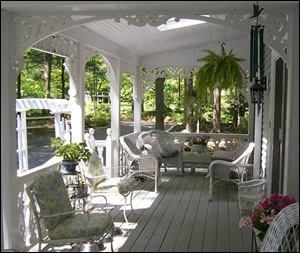 And as you know, porches also provide eye-catching curb appeal and increased value for your home. If you already have a porch we bet it serves you and your family in similar ways. But, are you enjoying all the advantages it has to offer? Is it deep and wide enough to accommodate your desired furniture for prime relaxing? Is it covered to allow you to watch a rainstorm? Is it decorated to provide the best first impression possible? And if you don't have a porch, well… it’s time to discover what you're missing! So whether you have a porch that could benefit from a little spring spruce-up or have always wanted to add a porch, now's a great time to start planning, and we're here to help! e are very eager to help you maintain the cost effectiveness of your Porch Items. We will not advise additional or more expensive items unless we sincerely believe they will add more to the value of your home than what they cost. One of our favorite money saving tips is our 2x3 Oval Turned Cedar Baluster. This Baluster is less expensive than our 3" x 3" Square Cedar Balusters. However, when Oval Balusters are installed with their wider face toward the street, they create a substantial effect similar to 3" x 3" Balusters. The turned section is oval rather than round and is quite elegant! We firmly believe the purchase of any of our porch items can and should be viewed as an investment, although admittedly, one of the few investments that can also be enjoyed for its non-monetary aspects! Here are even more ways to stretch your dollars! If we can be of further assistance, please let us know. We'd love to help with your projects in any way we can. And don't forget to "Like" us at Facebook to receive a $10 off Coupon for your next order!